I think that zoning-out is something that happens, to everyone. It happens mostly at the end of a long day, during a stressful time, or when there is too much to overcome. Maybe it is our mind that needs a break of a few seconds from everything, as it is a moment without thought. During this past year, I sometimes was not 100% present. I think my mind was fleeing reality, the menacing state of my mother’s health. Sometimes I catch myself spending time uselessly opening and closing tabs on my computer, without a real goal, once I do harness the problem I can fully get back to work. Sometimes we don’t completely listen to a question, just mechanically answer yes, only to ask a minute later “erm what did you ask?” Kids zone-out at school, which teachers always try to catch, but some can somehow reconstitute what was said or even actively participate while being quite absent. I recall drifting of into nothingness during a lesson, but at a certain point of not being fully there I decided that I should participate and answer the teacher’s question (the lesson was quite boring and he was struggling to find someone to answer, I guess most of us were zoning-out). When I was in primary school, I could spend hours at home not doing anything, especially not my homework. It did not feel as though I wasted time, but I was definitely not productive. My mother found a remedy something that helped me focus for the day, or for the homework session, something that would caliber my mind. She’d have me draw a lying down eight (or infinity sign) that I would have to closely follow with my eyes. Sometimes she would just take her hand and draw a lying down eight indefinitely in front of my into the air and I would have to follow the movement with my eyes. Somehow this little trick always got be back on track, got my mind focused again. This morning, I sat down and did the exercise, now I will be able to stay focused for longer! Zoe the Zebra zoomed in on Zachary the zookeeper in Zermatt’s zoo. Good job with the A-to-Z. Sometimes we NEED to zone out and take time just for yourself. Thanks for sharing your thoughts with us. Zoning out is so important. We allow our brain to relax and a space is created for creativity to come through. Perfect Z expression. Zoning out is not always bad. Agree with Gulara’s comment above. Now that I practice yoga on a regular basis I’m better at letting my brain slow down or zone out. Bravo, Solveig, for finishing the challenge. See you later. I wish I could zone out. I can’t. I will try that infinity exercise. I think that might be a good one. Congratulations on surviving the A to Z! I agree that when my mind is over-taxed or bored, I go into another world. It is easy to Zone out, especially now since I wear hearing aids. When I don’t hear and understand what is going on around me, I go into my inner space. It can be comforting in there. 😉 Enjoy your rest!! You know, “zoning out” has a negative connotation but it’s something we need to do from time to time. And it’s probably good for us (as long as we don’t do it too often). Thanks for the infinity sign trick. I’m going to try that. I think many A-Zers will be zoned out for at least the next week as we recover. I am now trying to read other people’s posts more and have a break for a few days from writing. I need to splat for awhile. Actually, I haven’t exactly splatted because I’ve almost finished reading “Matilda” by Roald Dahl. I haven’t read most of his books and bought his biography after writing my Dahl post for the challenge. At the same time, I’ve definitely slowed down. 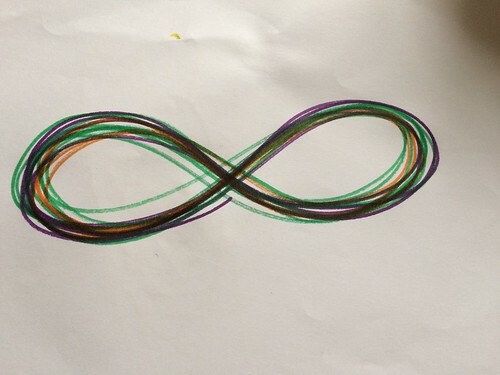 Do you know why the infinity sign helps you focus? I hear the teachers at the school say “eyes to me”. I wonder if that was your Mum’s way of attracting your gaze. I’m quite intrigued.